Entities Caught at my home!!!!! Ok, little back ground here. I am a big "ghost hunter" as you can say. I take it very seriously and have new high tec equipment. 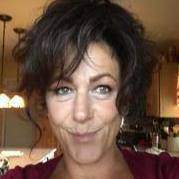 I would never post fake or "kinda things" , if my whole group can see the evidence clearly, then it is true. I am about to post what we did from our own house and back yard. I will post the original and then a zoomed in copy or black and white inverted. Some of the outside ones are very dark, so inverting the colors with show the objects. Please enjoy and let me know what you think. The one photo you will see is looking out my back door with the door shut. You will see an entity looking in my back door. To me this is not a "ghost" due to size and color and face and neck features. \ the third photo is actually a inverted picture of my husband standing infront of a brush pile in our backyard. 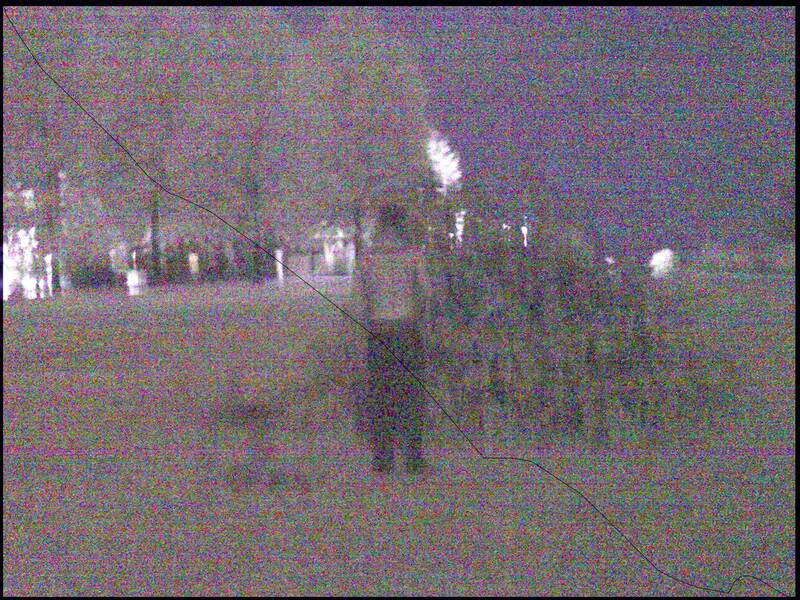 If you look far left in background under the 4th tree , you will see a shadow person standing under the tree. 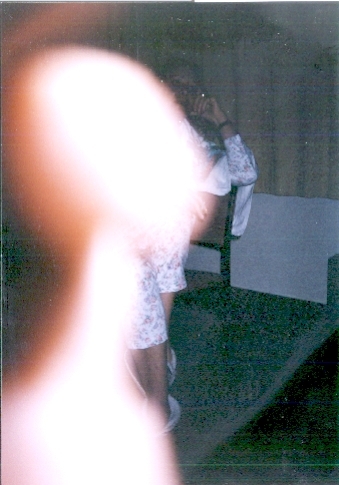 In that same photo if you look off my husband left shoulder, you will see a "angel" off his left shoulder infront of the trees with complete wings. Soooo proud of you Wheresourights! The one of the back door still gives me the willies. I can attest to what was stated above....and vouch for her honesty. I do have some other ones from local ghost trips around. - maybe i will post them too, i know i have a great one from the Harrisburg state hospital.. with a couple in period dress. 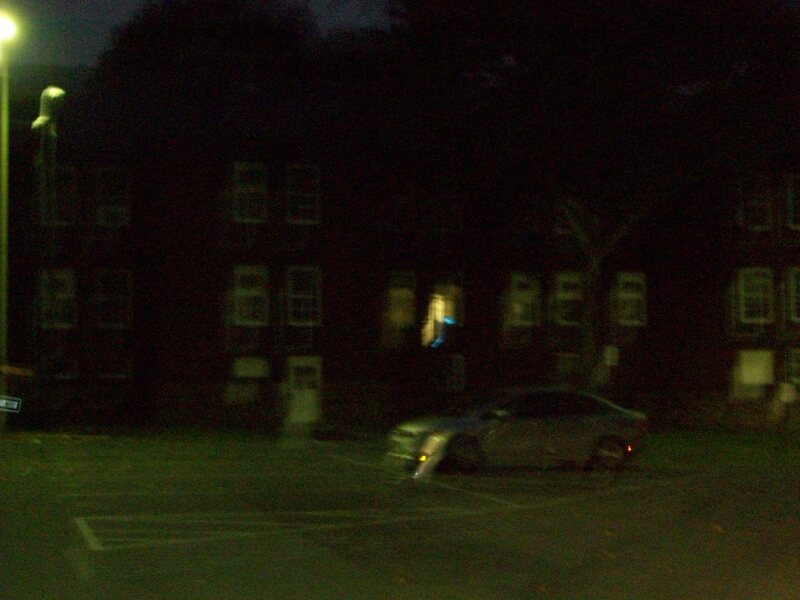 If you see in front of the of the car... and building there is a woman in white dress and a man ( looks like a tux) standing in front of the hospital. They are standing infront of building. might be easier to zoom in . and whos2kno: that story is not being told. did you call for them? Thanks for posting this Wheresourights. I'm curious, what kind of camera do you use? What settings? Hey,thanks for sharing those pics! * well we just ask if any one is here? Yes, my house is old, 1944. We already knew the old man died here in 2008, but there was early settlers here. Thus would explain the bow legged shadow man standing under the trees or the ghost box sessions referring to crops, wagons and such. Plus we have found old medical bottles in my back yard. Plus we have had our old ghost box go flying in the middle of the night, picked up and thrown into the dogs water bowl , ruining it. The picture at the hospital, was just a drive through with cameras. But the ones at my home were a full on investigation. * I just purchased a new IR -UV Paraspectrum camcorder/camera . These are made just for ghost hunting. They have spectrum lenses put in . Those caught the first batch of photos. 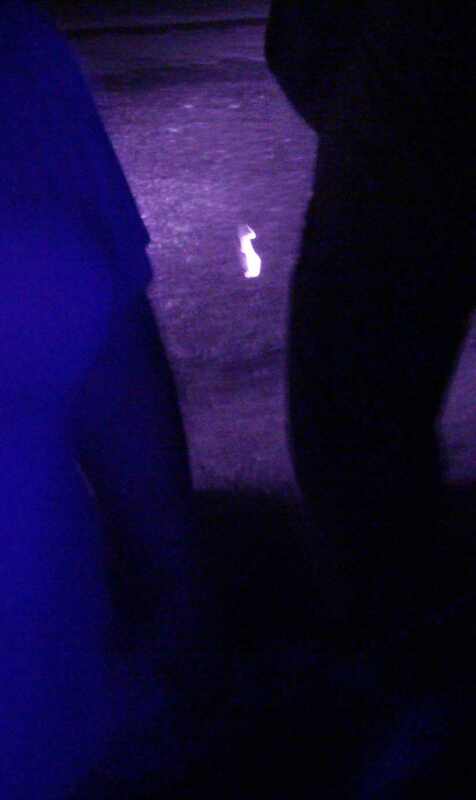 This camera high lites the material ghost are made up of with a florescent light. Actually the photos at my home, was the first time we used that camera. * The state Hospital photos where a regular digital camera! We have alot of equipment we uses, we also have a PSB-7 or "ghost box"
I have alot of other photos that I guess could be deemed worthy, and Breezy, whos2kno, and reddwolf are telling me to post them. So I will try to keep this updated. I know after the crazy stuff we got here, we want to do another investigation probably Wednesday night. So i will for sure update then. I just know the photo of the "thing" looking in my back window doesn't seem "ghost" to me. We try to debunk all photos and we couldn't debunk any of the ones I will post. I still try to wrap my head around all of these. It would be great it we could up load our ghost box sessions with clear voices from the "other side" ( if you want to call it that). ::puffs up chest::: that's my girl! I've been with her when she's done the Ghost Box sessions...and I can attest to my favorite grandparent - my paternal grandfather - coming through! She asked if he was there (at her old home) to say the nickname he gave me as a child...and it came through LOUD AND CLEAR!! The downfall is the "static" from the frequencies give me a horrible, dull headache within the first 15 minutes and makes me extremely tired - or sleepy. I can't do it with her for long...but we have gotten some interesting sessions. 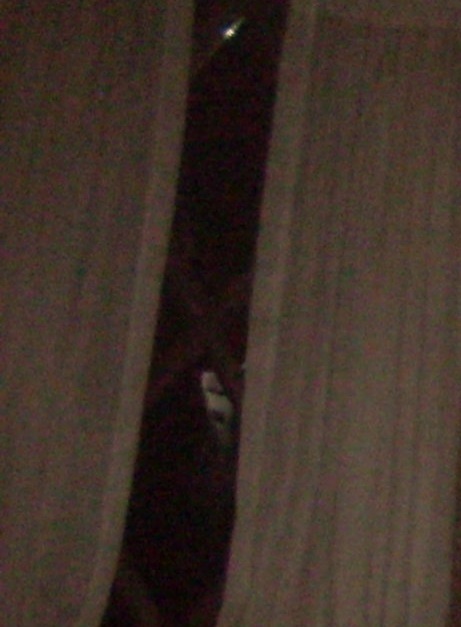 The picture of the "thing" looking in the window makes me not want to be there at night, lol. I visit her during the day only...lol. Thank you WOR and W2K. If there was not such a fine line between dimensions and everyone could see everyone else who is here also but outside our spectrum they would freak out - they are literally everywhere. I feel sorry for those who for one reason or another have not passed over and are stuck in the earthbound dimensions. Many years ago we too had a group that met monthly and at most meetings entities would appear and we would help them pass over. Rescues are very rewarding. The face at the window does look more 'solid' than what I would expect from a 'ghost', but perhaps it is not a soul stuck here int he lower realms, perhaps it is one visiting from the other side who wishes to incarnate. It looks like a female child to me - not planning to have a baby are you?? Yes please post more!!! This is right up my alley. I used to do investigations with a few friends years ago. Soooo much fun. I would love to analyze any photos you post and give some possible feedback if that is alright with you? LOL thanks everyone. I will tell you the gear is not that expensive on EBAY! Honestly- i was waiting for someone to say it- but i will throw my hate in the ring with the face in the window photo. I dont believe it to be ghost. I dont believe it to be human entity. I think its another being. 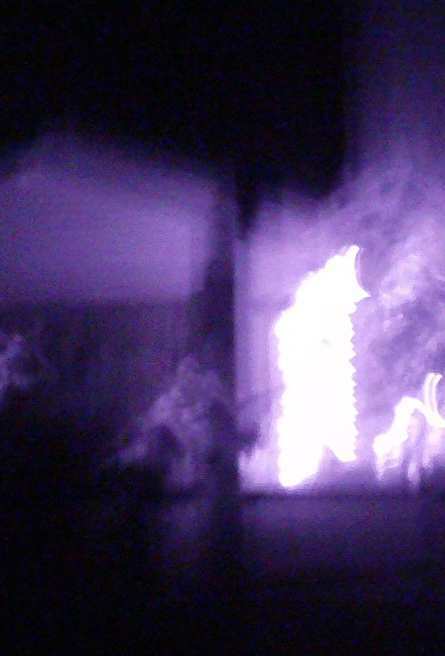 Our ghost box kept saying visitor , atmosphere, ..etc... plus stuff like black Alaska.. what that means I dont know. But to me, i see an alien like thing?!?! Husband kinda agrees with me and ...he never does so thats where we get freaked out. Here is my thought. Ghost can enter as please. This thing has a scream like expression on its face as it is peering in my back door window. Also if you zoom in , you can see the neck has a curve in it as if it is hiding behind the curtain. Plus from our measurements of trying to recreate this. It has to be 4 feet talk and the head is about 6-8 inches big. I know thats a big statement to make. BUT i am not ruling out other possibilities but i did GIGGLE: ghost,alien,scream face, and some people explain this looking thing to a T.
I will keep adding photos. I will see if husband will do another investigation Wednesday with me and we will post thursday. Also I know we did an investigation at my mothers house and the graveyard down the street. I know when we did it I saw stuff on camera but never uploaded off sd card. So I will do that tomorrow and see if anything good is on it. But as I said, somehow I have the best luck with photos??? Thanks everyone. I would say to all if your in PA, come on over!!! well now Jessica - that's something I never considered! Is that a GOOD thing...? LOL W2K, is what a good thing ? If you are talking about souls looking for a body to incarnate into this special time, then I know they come down regularly and visit their parents until they are conceived and then pop in an out until birth just to acclimatise with the body during pregnancy, but they dont stay in there until after birth. If you are talking about rescues, yes I found them very rewarding and we are running out of time to rescue them all IMO. I don't know about ET's visiting, this could be the case I just havent had any experience with it to date that I know of. well i will tell you this, there are NO BABIES on the way or being consider. I would rather hear the devil was looking in my back window then babies. ! !!! May not be alien but its still crazy. Does no one else have ghost pictures? I find this hard to believe!?!?! I have some but they are in a box somewhere. I'll see if I can find them his weekend. As for the face in the window, I noticed that the floor in the kitchen has a white with black/dark squares pattern. Is it possible that the face in the window is just a partial reflection of the floor? LMAO soul food... i choked on onion! Um my floor is actually white and green. And we tried to debunk it but nope not floor. Ok some of these are cropped to center on what ever is going on. 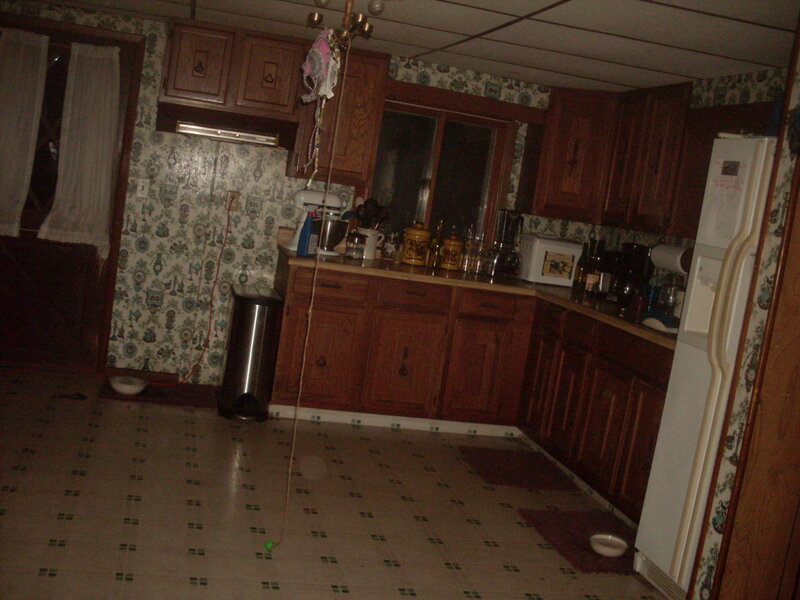 The first one is the best one from that night's investigation. There is an apportion infront of a fence pole dead center. 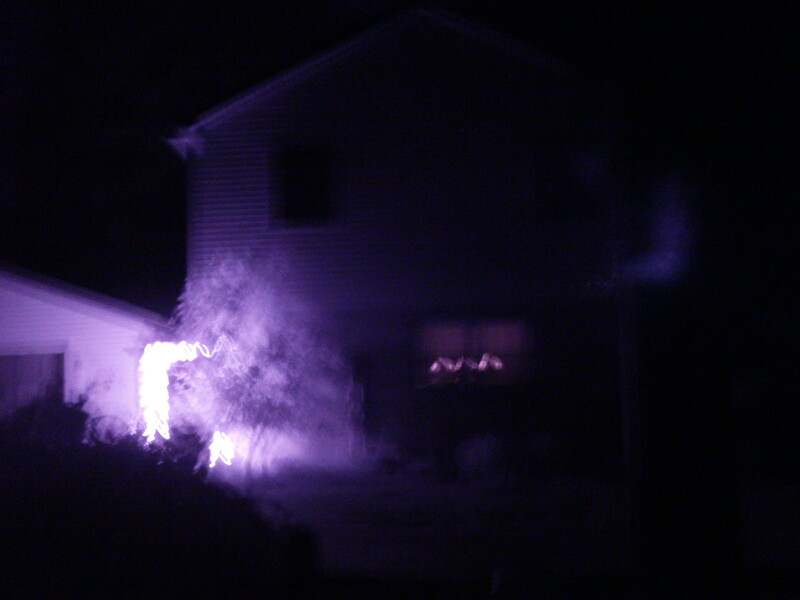 The holy glare of lights behind it , is just normal christmas twinkle lights reacting against the UV. As you will see the "things" arm is ontop of fence poll and the other one is stretched out. Also I know I can kinda see facial features. The second is looking down and I snapped a photo. I have a second reafter shot with nothing there. I saw it when I took it and quick took another one to see if it reappeared but nothing. Its weird like a lighting bolt. The creepy one w/the thing on the fence is in front of my house....saw it for the first time this morning. Momma ain't happy about that....now I'll never sleep, lol. Ha I think we all have ghosts in the closet! Ok I'm in here, this picture was taken by a friend of a friend a short time after I left their house, They felt a presence in the room and started taking photos. Now all the debunkers have said it's just a finger over the camera lense and maybe they are right, but take another look. The person who should have been centre shot is in full focus so how did the camera manage to do that with an object like a thumb in front of the lense. Not only that but I have tried to get my thumb to look like the shape that is exposed in the picture I just can't, also it just looks like some Et's I have meet, long neck large head, sloping shoulders it's all there, so the picture remains a mystery even though I'm prepared to say it's a finger over the camera lense. I’m my own best skeptic!